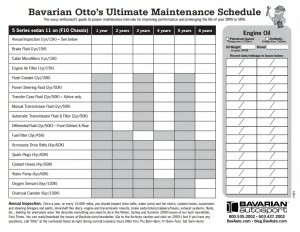 Looking for Otto’s ultimate maintenance schedule for your BMW or MINI? Read on to view a printable PDF! Click on the links below to see and download Bavarian Otto’s Ultimate Maintenance Schedule for your specific BMW or MINI chassis or model (US models shown). Can you give a bit more detail on your question? Love your stuff, but I was looking for the ultimate maintenance schedules that were talked about in the mailer/newsletter, but they seem to be down. Any word on when they might be available? Specifically looking for the E85 schedule. All set now. Again, we’re sorry for the delay. Any chance you will get these out there soon? All loaded now. We’re sorry for the delay. My daughter’s 1998 528i is approaching 200k miles. How long can power steering pumps last? How about ecu and fuel pump relays? How about the fuel pump? Anything else I should replace preventatively to avoid her being stranded? We don’t know how that squeaked through (cap, rotor, wires), but it was fixed today, likely just after you viewed it. We actually ran through all and did a fair amount of editing, while adding newer chassis. You may want to re-download it. The steering pump can be a “lifetime” unit. Keeping the fluid fresh goes a long way toward this. Since the pump will usually start to complain before a failure, this is an item that you can wait to replace until needed. Relays, again, can be long life, but not always. If you wanted to replace the main relays as a preventative measure (to help prevent a roadside failure), this would not be an unwise move. Fuel pumps certainly do have a definitive life. If the original is in place, you may want to consider a preventative replacement to assure that you won’t have a roadside fuel pump failure. Other common preventative replacements would include the water pump, hoses, belts, pulleys, thermostat and some even go as far as the radiator and the expansion tank as these also fail due to the plastic becoming brittle and cracking.